John Hart: Portrait of a Patriot ~ The History Girl! Soldier, sailor, tinker, tailor… spy? John Hart was none of these. Although farmer, fighter, and father would certainly apply! As New Jersey’s first Assembly Speaker he rates among the best of these and it’s time to learn the reasons why. A true unsung hero John Hart was among the early New Jersey leaders to play an integral role in the American Revolution. In part one of the novel TRENTON by Dave Hart and John Calu, the patriot and his family are confronted daily with the hardships, decisions and deprivations of that tumultuous time. In part two his legacy of hope is carried on to a reimagined, contemporary Trenton: a resurging city where the fight for the freedom of all Americans is on the cusp of being realized. Largely forgotten and ignored by mainstream historians, John Hart is the embodiment of the everyman. A common man cast upon the world stage engaged in a colossal struggle, he is able to succeed without fanfare where greater men have failed. Learn more about this noble rebel in "John Hart: Portrait of a Patriot," a documentary film written by Dave Hart and Mark Violi coming soon. In December 1776, the British advance into New Jersey reached Hunterdon County. A marked man due to his status as Speaker of the New Jersey Assembly, Hart was obliged to escape and hide for a short time in a cave in the nearby Sourland Mountains of present-day East Amwell Township. His farm was raided by British and Hessian troops, who damaged but did not destroy the property. 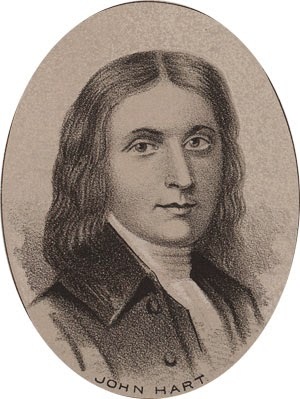 The Continentals' capture of Trenton on December 26, 1776 allowed Hart to return home. Born and raised in Trenton, New Jersey, John P. Calu left as a young man to pursue his muse in Santa Barbara, California, where he established SongFactory - a workshop funded by Jane Fonda, which led to a critically acclaimed children’s album. In addition to performing as a jazz singer and traveling throughout the Americas, he has been a California Artist in Residence, a Dramatic Arts Director for La Casa de la Raza, and a New Jersey Playwright through the Arts Council of Princeton. He currently resides in Lawrenceville, New Jersey. A lifelong Trenton area resident, David A. Hart received his Bachelor of Arts in History and Political Science from Rider College (now Rider University) where he also earned a Masters Degree in the school’s Graduate Program for Administrators. A published author and poet, he has won several national songwriting awards and other honors. In 1985 he organized the highly successful JAM For Hunger benefit concert held at Trenton’s City Gardens with all proceeds going to famine relief. He lives in West Trenton. Calu and Hart have enjoyed a productive collaboration as novelists since 2003. Their published work includes a contemporary adventure series featuring enigmatic Garden State sites, obscure local legends, and everyday mysteries along the Jersey Shore and in the Pine Barrens. 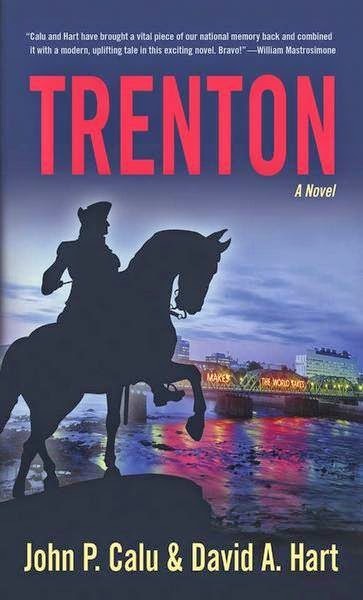 Purchase a copy of Trenton, A Novel.